On March 11, 2011, there was a massive earthquake and tsunami about 200KM north of where I live in Chiba. People always ask how bad the damage was in my area. Although there was a huge problem with liquefaction, my apartment wasn't bad at all as you can see below. I was so lucky not to be in Japan when the quake hit. Instead I was watching from a condo in Manila. The quake and especially the tsunami footage being shown on NHK International was just unbelievable. There were tsunami warnings in the Philippines, although as far as I know there was no damage. Still, I stayed up on the 20th floor watching on TV until it passed. Not long after the news about the earthquake in Japan, I found a video from a geeky-sounding guy who is in my prefecture. As I'd heard, the quake started off slow and then suddenly increased in intensity. And it was long. Based on the shaking in this video, I was fearing for the worst about the condition of my place. As it turns out, this guy is closer to Narita, so he was inside the most severe shake zone...my place was on the other side of the shaking fence, so to speak, so I didn't see any damage, and there was only a bit of mess. First a quick glance into my back storage room when I got in. 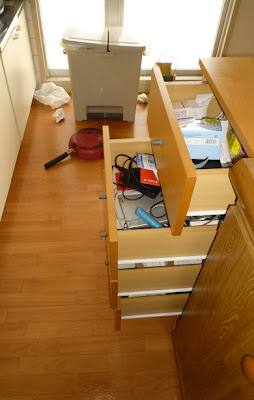 I had the bookshelf attached to the wall (standard earthquake-prep in Japan). But I guess it didn't work as it looks like an angry poltergeist went to town on my books. Not that the messy books mean that much. Here's a shot from my other bookshelf...and as far as I can tell, it's exactly as I left it. I'm a slob, what can I say. In fact, the only thing that broke in my place was a wine glass....that fell out of the cupboard when I got home and stupidly opened it to see if anything was broken. So after a long day of travel, I christened my apartment with about a billion tiny shards of broken glass that flew all over the floor when it smashed. DUH! The place I live -- in fact all of the Tokyo Bay coast in Chiba -- is on "reclaimed land." This entire area used to be under water. So when a big earthquake hits, the water just reappears up through the ground in a process called "liquefaction." That caused more damage than anything else in this part of Chiba. Here's a video from my area on the day of the earthquake. All that mud that starts to pour out as the flow gets stronger is the foundation of the parks, parking lots and other areas around Kaihin Makuhari, some of which sunk as much as 1 meter. Certain areas of that convention center are like walking on a roller coaster with all the troughs created when the ground leaked out from under the pavement. Here's a few pics of the rollercoaster. And an interesting point about language...I doubt there's a child in the English speaking world who would know the meaning of "liquefaction." Yet when I was out in the park, I saw a kid of about 5 years old talking to his dad about "ekitai gensho." So it seems that our linguistic skills really are a product of our environment! Although I was truly lucky to have been away for the quake, the tsunami and the radiation, 20,000 or so people were not so lucky. I've asked a friend who was involved in the relief effort to send me some links to reputable relief agencies. I'll update this post when I get the links.